We are one of the leading numismatic dealerships in India. Since 1984 we are in the field of Numismatics and have experience of over three decades. In 1987 we opened our first Numismatic shop in Ahmedabad and in 2010 we moved to our flagship showroom at 105, 3rd Eye Complex, C. G. Road, Panchvati, Ahmedabad - 380006. Gujarat. Since 2010 we have ventured in public auctions of numismatic material and we take pride in being one of the first auctioneers recongnised by a license issued by the Government of India to deal in antiquities, which we obtained in 2010. We believe in our future as a numismatic firm and our commitment to the profession is reflected in our practice as a dealership. Since 2008 we held our personal coin fair every year in the month of August. It is the most popular fair called Ahmedabad Coins and Currency fair. Consign your Coins and Paper Money in our Auctions and reach India’s most active collectors to get the best price of your items. We also offer cash advances on high grade and high value items. Shukla Day Coin Fair will be held from 19th to 21st April 2019. Venue: Expo Center, World Trade Centre, Cuffe Parade, Mumbai, Maharashtra. 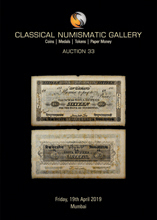 Classical Numismatic Gallery's Auction 33 will be held at 5:00 PM on Friday, 19th April 2019. Venue: Expo Center, World Trade Centre, Cuffe Parade, Mumbai, Maharashtra. Coinex-2019 Exhibition will be held from 31st May to 2nd June 2019. Venue: 7th Street, Gandhipuram, Coimbatore-641012. Numismatic & Philatelic Exhibition will be held from 7th to 9th June. Venue: Indian Council for Cultural Relations (ICCR), 9A, Ho Chi Minh Sarani,2d Floor, Auditorium Nandlal Gallery, Kolkata - 700071. Coin Fest 2019 will be held from 12th to 14th July 2019. Venue: Haldiram Banquet Hall, 24 Ballygunge park, Kolkata, West Bengal. Ahmedabad Coins and Currency Fair 2019 will be held from 9th to 11th August 2019. Venue: The President Hotel, C.G. Road, Opp. Municipal Market, Navrangpura, Ahmedabad. Classical Numismatic Gallery's Auction 34 will be held on Saturday, 10th August 2019. Venue: The President Hotel, C.G. Road, Opp. Municipal Market, Navrangpura, Ahmedabad. Notification: Your IP is : 54.90.86.231 . We log IP addresses for security reasons.